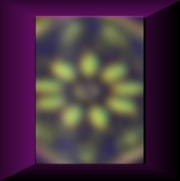 The Flatland Digital Artwork Clip Art Gallery: Flower Unfocused. A watercolor chrysanthemum (yellow and brown) in a metallic purple frame. Blue, gold, and brown details.